Florida is one of those areas where the power grid is not as reliable as it should be, especially during hurricane season. If you happen to live in an area that gets frequent blackouts, you don’t have to just sit in the dark and wait for the lights to turn back on. A generator could be the perfect solution if you want to keep your home up and running. Read on for more information on how they can help your home. Hurricane season has arrived, and while Florida civic authorities go above and beyond to keep us all safe, it pays to have back-up ready at a moment’s notice. A generator for your home is a big step in the right direction, and when it comes to generator installation, Gainesville has services that can perform the job properly. Before they do so, however, you need to make the decision to install a generator in your home. Here are 3 reasons to do so, which you should carefully consider when making this decision. Reliable power. Obviously, a generator exists to provide you with power in an emergency. As long as you keep it fueled and maintained, it will be there when you need it” providing power for light, heat, refrigeration and contact with the outside world. That’s important in every home, but especially important for those who have special needs, such as medical equipment and other devices that absolutely need power. Safety. A generator that keeps your refrigerators and other key appliances going means that you won’t have to venture outside in search of necessities during an emergency. It keeps food cold, bathing water hot, and household lights running: meaning that you can stay safely indoors until the crisis has passed. Versatility and resale value. If you have a portable generator, you can take it with you when you move, ensuring that you have reliable power no matter where you call home. If your generator isn’t portable, it will add resale value to your home: possibly enough to offset the cost of installation depending on the specifics. Either way, you’re not looking at a dead-end cost with a generator. You’re looking at an investment in your property that can give back for months and years to come. For more reasons to schedule generator installation, Gainesville residents can call upon the experts at Touchstone Heating and Air Inc.
We have years of experience handling generator installation, and we can take you through all the steps before we begin. Your satisfaction is our primary concern, so don’t hesitate to contact us today. Florida means hurricanes, and hurricanes mean a loss of electrical power just when people need it the most. In cities like Gainesville, FL, generators are practically a necessity for any responsible homeowner. Generators can keep you warm and comfortable in the midst of a crisis, as well as maintaining key parts of your household such as a refrigerator (storing food) and radio or Internet services (keeping you in contact with the outside world). Buying a new generator is an important process, almost as important as keeping it fueled and maintained in anticipation of hurricane season. Her’ a list of things to look for in a new generator. Sizing: By this, we don’t mean physical size (though that could come into play depending on where you wish to install the generator), but rather the amount of power it generates. You should determine exactly how much of a load you intend to place on your generator, then resolve to never go over it. Beware of ordering a generator that’s too small. Better to err on the side of a larger size and keep the generator operating than finding you need more power in the middle of a torrential rain. Maintenance and fuel issues: Make sure you know what kind of fuel your generator uses and what its rate of fuel consumption is. Generators can run off propane, diesel, gasoline or similar fuels, and you want to make sure you have plenty stored with it. Calculating fuel consumption is just as important: you don’t want to run out of gas in the middle of a storm. If you need Gainesville, FL generator service, talk to the experts at at Touchstone Heating & Air. We can discuss things to look for in and new generator, then perform an installation with courtesy and care. Pick up the phone and give us a call today! Why is a Professional Generator Installation in Gainesville, FL Necessary? 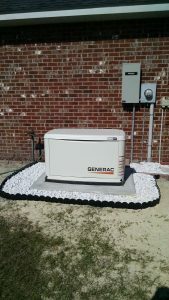 In Gainesville, FL, generator installation provides security and peace of mind for your family during inclement weather. We see our share of big storms and hurricanes here, which can wreak havoc on even the more reliable civic electricity system. With a good back-up generator, you can stay connected to the outside world while keeping lighting, air conditioning, and other vital equipment running. It can be enticing to try and install a generator yourself in order to cut down on costs, but that decision is usually a mistake. Why is a professional generator installation necessary? A few of the strongest reasons are listed below. Sizing. Like air conditioning units, generators need to be a specific size to fit the power needs for your home. It can be a complicated equation, but trained experts know how to arrive at the most accurate conclusion and find a unit that is perfect for your needs. They can also recommend the most reliable and efficient brands for you, helping to eliminate some of the guesswork. Installation. Installing a generator can be tricky, and will involve proper permits and other bits of paperwork. You also need to know where to place it on your property so that it will stay safe and dry, proper ventilation to let emissions clear your home, how it will handle the electrical load, what must be done to secure it in place and a host of similar issues. Experienced professionals know how to address them with speed and efficiency. Insurance. Qualified professionals possess the correct certification and are usually backed by sound insurance. That protects both them and you in the event something unforeseen happens, allowing them to install your generator with confidence and assurance. A professional generator installation in Gainesville, FL is not only necessary, but actively helpful in ensuring your generator is ready to go when the next big storm hits. Touchstone Heating & Air operates in Gainesville FL, generator installation is a cornerstone of our business, and our trained staff are dedicated to your complete satisfaction. Why go to anyone else? We’re here to help, so give us a call today! Posted in Generator | Comments Off on Why is a Professional Generator Installation in Gainesville, FL Necessary? Electricity is the foundation of modern civilization, providing us with the power to run everything from our computers to our electric dishwashers. Most households get their electricity from the local power company, which in Gainesville, FL, likely means Gainesville Regional Utilities, which has served the city for over 100 years. However, you may wish to consider using a home generator to supplement your power needs. It can provide a number of benefits including (but not limited to) the following. Emergency power: Gainesville is hurricane territory and when the rain starts falling you can’t always be assured that the lights will stay on. A home generator lets you power the your house during an emergency, keeping your house safe and comfortable. Food storage: If your power goes out and the refrigerator isn’t running, you run the risk of losing your perishable food items. A generator will save you money by making sure that no matter how long the power is out, you won’t have to throw away all the food you have stored in the fridge. Electrical appliances: Everything from your TV to your AC runs on electricity. If you are in an area prone to power outages, a generator can keep them from disrupting your daily life. This is especially important if you have any medical equipment in the house that a family member relies on. Hurricanes are no laughing matter and even during milder storms, the electricity can cut out at inopportune times. A home generator serves as important insurance against that happening, help to keep you home comfortable and safe when the weather takes a turn for the worst. If you live in Gainesville, FL, talk to the experts at Touchstone Heating & Air for advice on home generators. Not only can we find the right generator to fit your home and lifestyle, but we can set up a maintenance plan to ensure it’s always running at top efficiency when it’s needed. Contact us today to set up a consultation.